Resist the urge to fling open your windows. You’ll be inviting not only pollen inside, but also moisture from outside air in humid areas of the country. 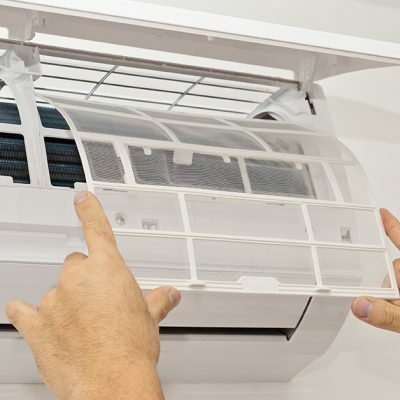 When warm, damp air hits cool surfaces in your house, the water in it condenses, which leads to mold growth on furniture, HVAC grilles and drywall. Use an inexpensive monitor to measure indoor humidity and aim for a reading between 35% and 50%. If it reaches 60%, you’ve got an issue; call your HVAC professional for advice. Inspect your insulation, rafters and floor joists. Take advantage of pleasant temperatures and pay a visit to your attic. See any wet spots? Call a professional right away, because correcting moisture problems is not a do-it-yourself project. A buildup of mold in your attic not only affects the air you breathe, but can also cause structural damage. A spring Saturday is a great time to seal leaks around windows, door frames, recessed lighting and electrical outlets with caulk or foam. When air escapes through these leaky spots, it’s sometimes replaced with air sucked in from the basement, crawlspace, garage or outside — places full of mold, chemicals and pollen. Purchase a true HEPA cleaner. An air filter can make breathing easier, but avoid cheap varieties that produce ozone, which is bad for your lungs. If you have allergies, choose an air cleaner with a true HEPA filter, which is one that can trap 99.97 percent of particles at least 0.3 microns in size, and spring for a true HEPA filter on your vacuum cleaner as well. “HEPA-type” filters are less expensive but don’t clean as well, so be sure to read labels carefully. Give your whole house a thorough cleaning. Since you’ll be bringing pollutants inside on your clothing and skin, wash your sheets once a week with perfume-free laundry soap. Go easy on the fabric softener, which is often laden with irritating chemicals. And while we’re on that subject, avoid candles and air fresheners with synthetic fragrances; they’re known triggers for allergies, asthma and headaches.